The Grange, officially referred to as The National Grange of the Order of Patrons of Husbandry, is a fraternal organization in the United States that encourages families to band together to promote the economic and political well being of the community and agriculture. The Grange, founded after the Civil War in 1867, is the oldest American agricultural advocacy group with a national scope. Major accomplishments credited to Grange advocacy include passage of the Granger Laws (regulating fees charged by carriers of agricultural products) and the establishment of rural free mail delivery. 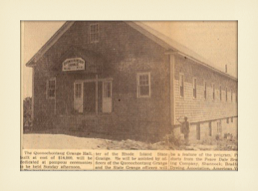 The Quonochntaug Grange was formed on March 28, 1911. The original meeting place still stands and can be seen behind the group of stores along Route 1 and 216. 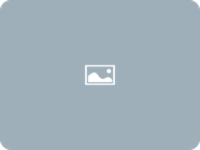 This building was not considered adequate and a new and our current building was erected further north on Route I at its present location. The new site was a 200’ x 500’ lot (.25 acre) sold to the Grange by Richard Hutchins’ parents for $600. 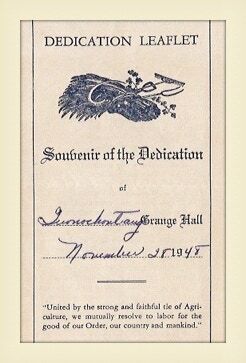 The new building was dedicated on November 28, 1948. 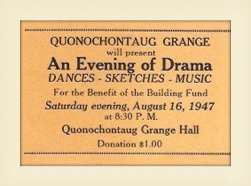 The Quonochontaug Grange sold its building to the Dunn’s Corner Fire District on March 18, 1999. The Grange remains an active place for community events besides Grange meetings. The building is used for Boy Scout meetings, Association and Tax District meetings, Dances, private parties and fundraisers. It was used by St. Andrew Lutheran Church for its Youth Ministry before the congregation had their own building and for Roman Catholic Masses. It still hosts many community wide events like Quonnie, The Musical, The Quonochontaug Historical Society, political groups, Arbutus Garden Club and various fundraisers and private parties. The Grange was used as a polling place for elections, Yoga and 12 Step meetings. For some historical photos of the Grange, CLICK HERE.